“Hair” will be NBC’s next live musical, the broadcaster announced Thursday. Coming on the heels of the critically-acclaimed NBC live staging of “Jesus Christ Superstar” on Easter Sunday, “Hair Live” is currently slated to air in spring 2019. Craig Zadan and Neil Meron, who have executive produced each of NBC’s live musicals since “The Sound of Music,” will executive produce the telecast. The scheduling of “Hair Live” comes as NBC’s planned staging of “Bye Bye Birdie” starring Jennifer Lopez is still awaiting a premiere date. The latter production was originally slated for a winter 2017 debut but was pushed twice due to Lopez’s packed schedule, with it now scheduled to also air in 2019. 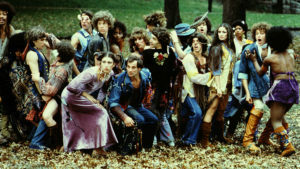 “Hair” tells the story of a group of politically active hippies living a bohemian life in New York while fighting against and resisting the Vietnam War. Claude, his good friends Berger and Sheila, and their “tribe” are coming of age in the world of the sexual revolution while struggling with their rebellion against the war and their conservative parents and society. Claude must decide whether to resist the draft as his friends have done, or succumb to the pressures of conservative America to serve in Vietnam, compromising his principles and beliefs. After an off-Broadway debut on Oct. 17, 1967, as the inaugural production of Joseph Papp’s now-legendary Public Theater, the show opened on Broadway in April 1968 and ran for 1,750 performances. “Hair” quickly became not just a smash-hit show, but a genuine cultural phenomenon that spawned a monster cast album and a number song on the pop charts for the Fifth Dimension. Simultaneous productions in cities across the United States and Europe followed, including a successful London production that ran for 1,997 performances.